Did y'all see Randy's challenge to us for last night . 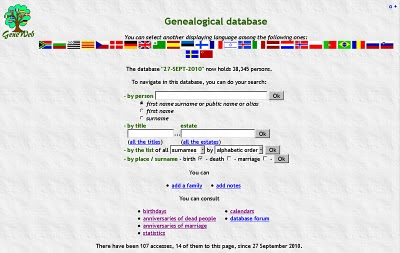 . .
Is there a person in your genealogy database that has the same birth date that you do? If so, tell us about him or her - what do you know, and how is s/he related to you? For bonus points, how did you determine this? What feature or process did you use in your software to work this problem out? I think the Calendar feature probably does it, but perhaps you have a trick to make this work outside of the calendar function. ALL of the people in the following list were born on the 10th day of November . . . as was I . . . the ones with just an initial for a first name (at the end of the list) are currently known or assumed to be still living . . . and those weird relationships shown to explain their connections to me are exactly as generated by FTM 2010 . . . my FTM 16 kept telling me I had errors in my database, and nothing I tried would make it go away, so I started using the FTM 2010 that I have had sitting here for almost a year, and now it apparently is not able to export back to FTM 16 . . . The above list . . . as well as the daily lists I post > HERE < . . . are quickly generated by a program on my computer called Geneweb . . . I do not do ANY updates or add information to the tree in Geneweb . . . 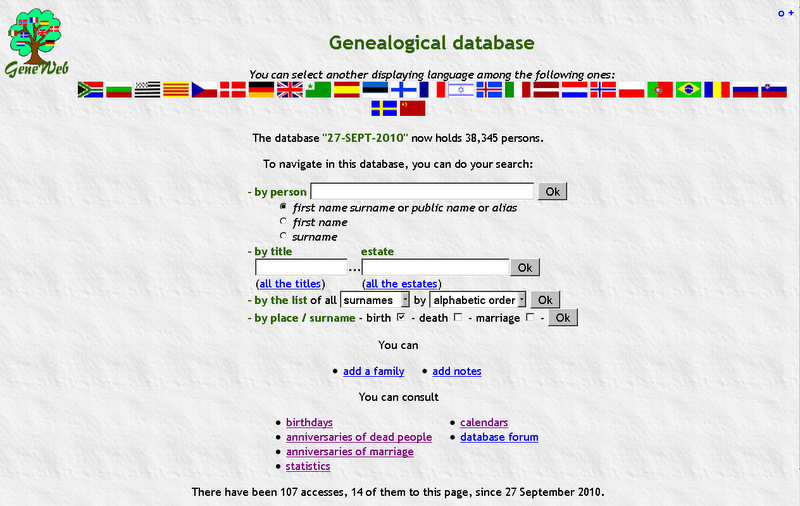 I use it solely for the purpose of generating these lists, and for figuring degrees of consanguinity . . . near the end of every month I export a fresh GEDCOM from my FTM 2010 . . . and import that new GEDCOM into Geneweb . 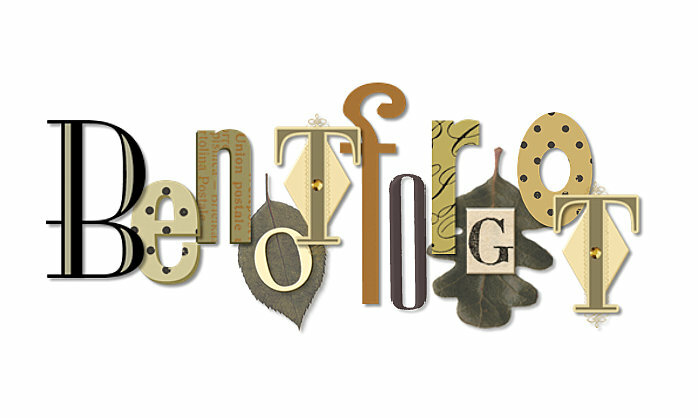 . . the page just above is the homepage of my Geneweb as I opened it today . . . towards the bottom of that page are clickable links for . . . birthdays . . . anniversaries of dead people . . . anniversaries of marriage . 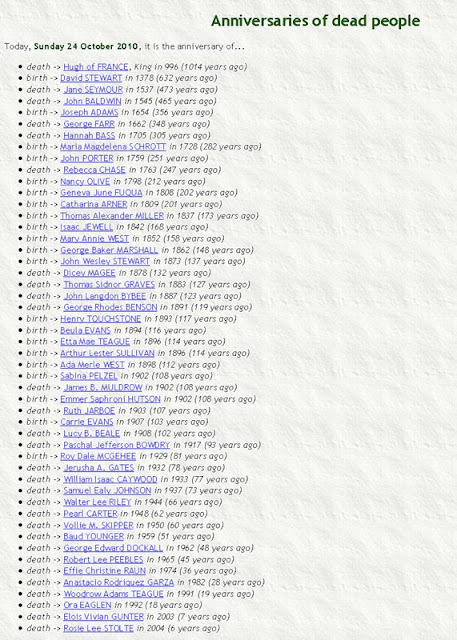 . . the birthdays link generates a list of people with no death dates indicated and feasibly still alive . 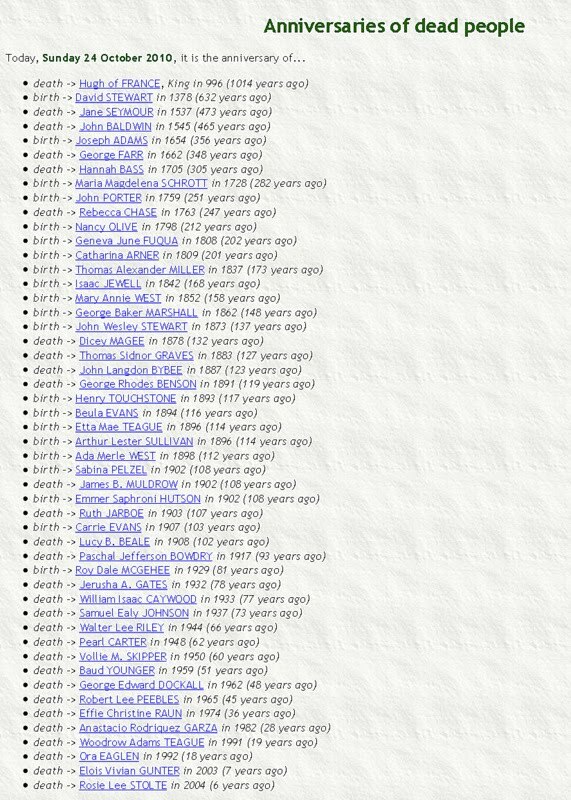 . . the link for anniversaries of dead people generates a list such as the one below showing todays births and deaths . . . I simply copied and pasted the list for the 10th of November . . . and deleted the death dates . . . and typed in the relationship info after looking up each individual in FTM 2010 . . .
FYI . . . this program is a little tricky to figure out . . . or at least it was (and still is) for me . . . e.g., I am right now sitting here trying to figure out how I previously used this program for displaying the percentages of consanguinity . . . Thanks for the info on Geneweb, heard of it, but never downloaded it. Just went a grabbed a copy to play with, should make some things easier. Cool! I have always wanted a program that calculated consanguinity. I'm going to download a copy of Geneweb right now. Thanks for the info!